Delicious Mango, Burnt Orange and Pepper - Polish This! The other week I thought that as it's already September I should really try to do something more fall appropriate. And then I did this manicure. And well, then the weather changed and it has been almost like summer here since. I'm not certainly complaining about it, no! But anyhow, I'm going to share this manicure with you eventhough the colors aren't the most weather appropriate right now. So this is quite simple shimmer gradient I did with three different polish. I used Zoya Pepper and ulta3 here, two coats of each. 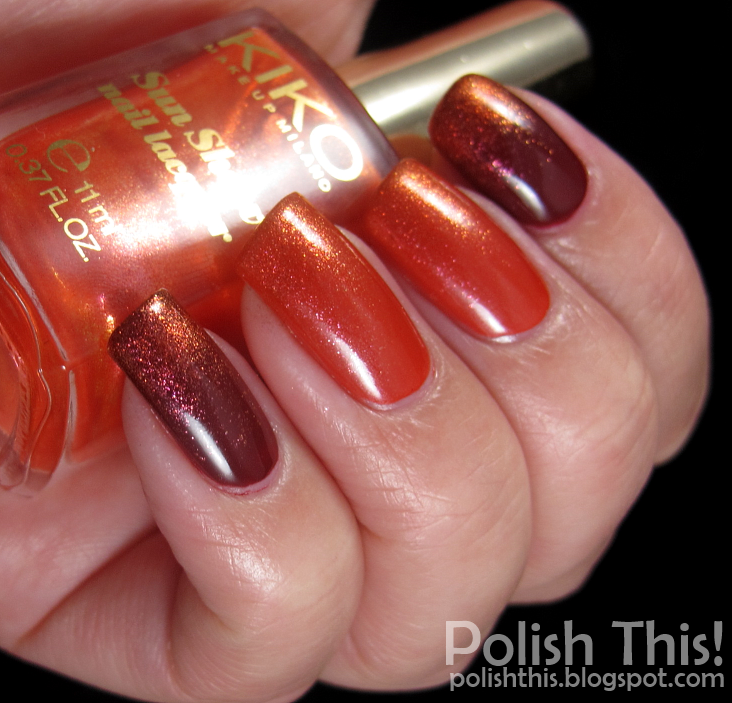 Then I did the gradient with just adding some Kiko Delicious Mango on top of each nail with a sponge. This was actually supposed to be a base for some nail art stamping, but I failed miserably with that. Believe me, I did try! So for now you are just going to see this gradient and I will go and practise my stamping skills even more. Though I have to say, I really liked this simple gradient manicure too and I kinda wish I hadn't ruined it with those failed stamping attempts. The duochrome shimmer in that Kiko comes really alive over the darker Zoya Pepper. Actually I prefer it like that, it surely looks best layered over some darker polish. Oh and I wanted to show you also a picture without that gradient since this was the first time ever that I tried any of ulta3 polishes and I wanted you to see the gorgeous color of that Burnt Orange polish! I have to say that I was really pleasantly surprised with this polish since it had really nice formula and I really like the color too! It was very easy to apply, it only needed two easy coats for full coverage. I got this Burnt Orange and another ulta3 polish from my friend who bought them for me from Australia as souvenirs. So if you ever go there (lucky you! ), you should definitely check this brand out! Disclosure: I have originally gotten Zoya Pepper for review. For more information view my disclosure policy. You can check out my swatches and review of it from this post. Great manicure, love that Kiko! Thank you! :) That Kiko is awesome!